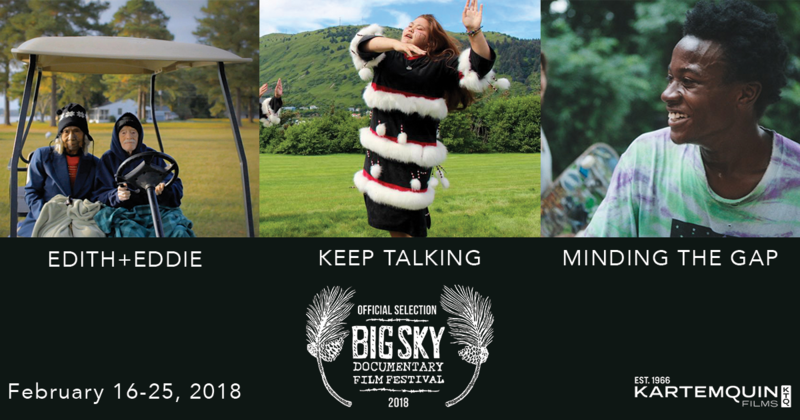 Three of Kartemquin's newest releases, Edith+Eddie, Keep Talking and Minding the Gap will screen at the 2018 Big Sky Documentary Film Festival in Missoula, Montana, running February 16-25. Winner of the IDA Best Short Award and one of 10 short subject documentary films to advance in the voting process for the 90th Academy Awards® (official press release here. ), Edith+Eddie by Laura Checkoway tells the story of Edith Hill and Eddie Harrison, ages 96 and 95, America's oldest interracial newlyweds. Their love story is disrupted by a family feud that threatens to tear the couple apart. Winner of the first place prize in the 'Made in Alaska' category at the Anchorage International Film Festival, Keep Talling, the directorial debut from Karen Lynn Weinberg, follows four Alaska Native women fighting to save Kodiak Alutiiq, an endangered language now spoken by less than 40 remaining fluent Native Elders. The debut feature from director Bing Liu, Sundance-bound Minding the Gap follows three young men as they bond together to escape volatile families in their Rust Belt hometown. As they face adult responsibilities, unexpected revelations threaten their decade-long friendship. Find the full list of official selections for the 2018 Big Sky Documentary Film Festival here.